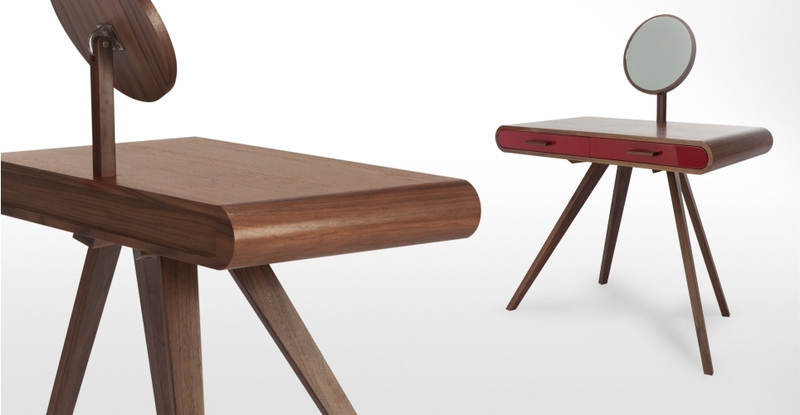 Today’s Chic Showcase features this gorgeous Fonteyn dressing table in Walnut and Red. Inspired by a dancer’s poise, the curved top and elegant legs give an impression of fragility, but in fact it is incredibly sturdy made from solid walnut and thick walnut veneer. The award winning designer, Steuart Padwick creates modern, popular pieces and this dressing table is no exception. I love its retro feel and slightly alien like appearance. What a statement piece! Now you may think that such design commands an extortionate price but you’d be wrong. Well this time anyway! The Fonteyn Dressing Table is available in a made.com sale this week for just £399 instead of a typical high street price of £1295. Now that is a real bargain and one worth looking into. Be prepared for a long delivery time as these pieces are made to order, but at least you know you’re getting top quality. For more information on the Dressing Table and lots of other goodies, take a look at the Made.com website. Oh I love, love love this!!! If only I had room for a dressing table! I love it. And I also love how lovely it looks on your fab new blog, it is all looking so amazing Jen!